Home / Games / Is Character Alignment Genetic? Some time ago I found myself browsing through some of those character alignment memes for fun. Now, generally, these tend to use fictitious characters like all the ones in this post on the Official Nokia Blog. After I stopped chuckling, the meme got me thinking: If I were an RPG character, how would I classify myself? 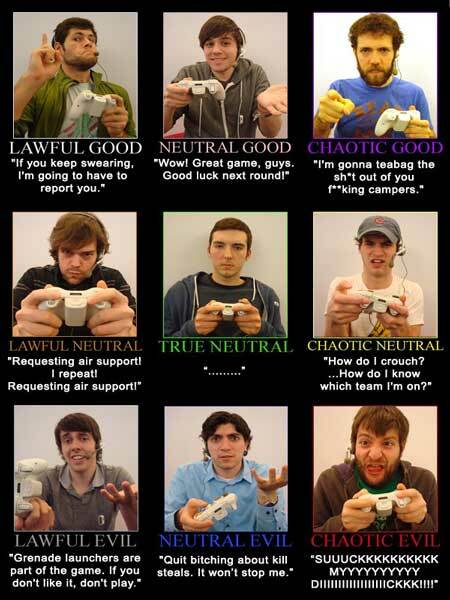 After some reflection, I determined I was Chaotic Good. Then I thought about my husband. He is definitely a True Neutral. Then, of course, I thought about my daughters. We have two daughters who seem to be shaping up as a Neutral Good and a Chaotic Neutral. Then that, in turn, got me wondering about a possible genetic predisposition towards a certain Character Alignment. Now for our “N-of-two” study, these fall squarely in the range of inherited possibilities. When graphing, however, two points are only barely enough to even draw a straight line. We can’t rely on my small sample of two children; we need more data. So, before drawing any conclusions, I think we should run a larger trial size, no? Okay, does anyone out there want to pipe in? Come on, RPG fans. What Character Alignment do you consider yourself in real life? And, if you have a significant other, how about him/her? What about the kids? How are they turning out? “Evil” folks, don’t be afraid to ‘fess up. We’re not talking actual good and bad here. And we know you’re not actually Voldemort’s secret cousin. “Evil,” in the context of this discussion would just be that wild hair on the back of your head wanting to play the rebel once in a while (**wink**).